Using a comprehensive statistical analysis, Kassell and Drake  were able to illustrate the fatal consequences of aneurysmal rupture. Many authors have advocated an early operation to reduce both the rebleeding and vasospasm rates [2, 4, 11–13, 21]. Nevertheless, the results of early operations have been varied and, in their interpretation, are not uncontroversial. 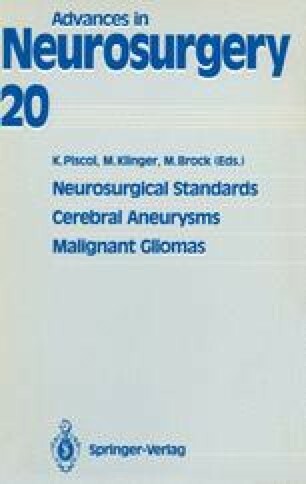 Discussion centered mainly on the range of criteria for an early operation in terms of aneurysm site and grade at the time of admission [1, 5, 7, 9, 10, 15, 20]. A comparison of the various treatment strategies reveals methodological problems due to differences in selection when the patients are allocated to the clinics and due to the choice of outcome parameters [13, 16]. Generally recognized as comparison values are the definitions of management mortality and management morbidity, which were coined by Lougheed . In this paper, we present the management results of a series of predominantly delayed operations on ruptured aneurysms.